MyBB allows you to become a reseller of the forums which means that you can create a free service with the forums belonging to your own domain (eg: forum. @domain.tld), including the possibility to customise your partnership service and to earn the money. Becoming a reseller you will need to have a personal domain name and an account in our partnership program [Link]. 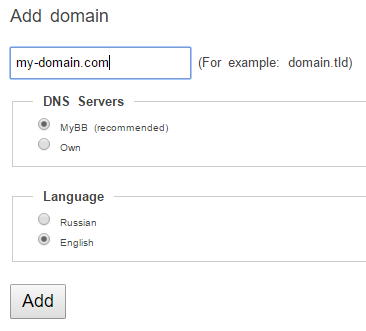 To setup your service, add the domain name you would like to use, choose preferable DNS settings and localisation (currently Russian and English available). 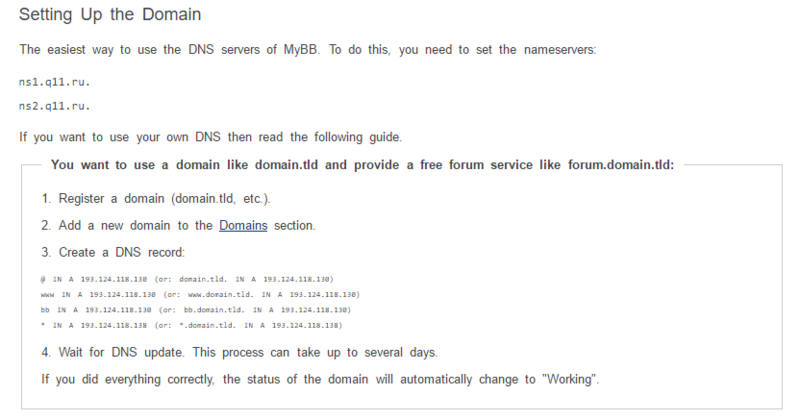 To use the MyBB DNS Servers is the easiest way but sometimes it's necessary to use DNS Records, in such a situation you will have to use other DNS Services that may be paid. If you want to use the main page of your domain for other purposes (eg: for a forum), you are to use DNS Records * IN A 193.124.118.138 (or: *.domain.tld. IN A 193.124.118.138) and bb IN A 193.124.118.130 (or: bb.domain.tld. IN A 193.124.118.130) only. In the following 24 hours, your reseller service will be set. Now you can customise forums' content (HTML-header, HTML-footer, The top banner code, Bottom ad unit code), and your reseller site (Home Page, Registration, Registration Complete Page, User Agreement, Forum Directory, Contact Us, Forum not found, Mail Template). 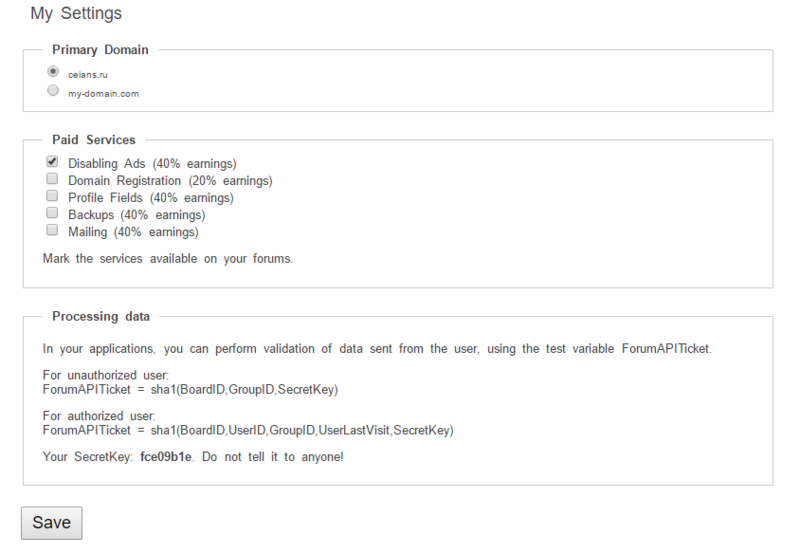 Global Settings will allow you to disable the paid services and customise the primary domain. Note: if you disable ads MyBB still occasioanly will show them. 1) Does the interstitial page (click.php?) exist on all forums for external links, and can it be customized to fit the design of the partner's main site (banners, links, etc)? 2) Can my existing live forum be migrated to the new partner domain once it's set up? 1) yes, it does exist and non customizable. 2) unfortunately, not possible, too. Partnership services and mybb have different servers, migrating physically restricted. I had the same idea some time ago and even sent an e-mail to Admin. His answer was frustrating though.